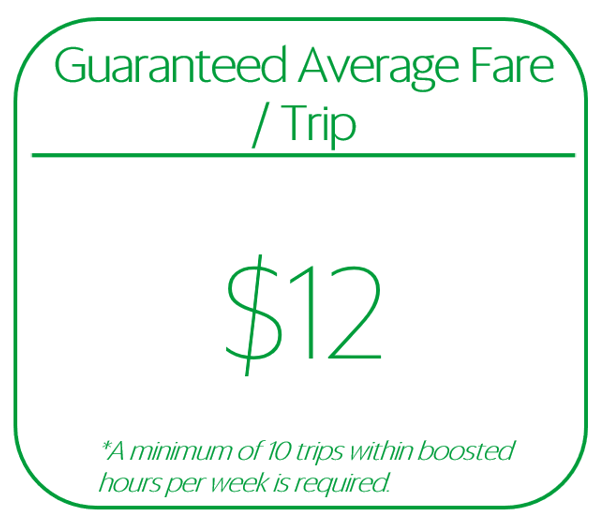 Average Fare Guarantee: Making every ride count! Introducing Average Fares Guarantee – a reward scheme that ensures every trip you drive is worthwhile! Say goodbye to worrying about low fares, especially during peak hours. Drive during the boosted hours, and get at least $12 per trip! To learn more about other opt-in incentive schemes under Grab’s Own Time Own Target Programme, click here. Why choose Average Fares Guarantee? ✔ No need to drive long hours ✔ Less worry about low fares ✔ Get rewarded for driving during boosted hours! Exclusive offer: Opt-in for Average Fares Guarantee! Be among the first 2000 to sign up for Average Fare Guarantee! Enjoy an Average Guaranteed Fare of at least $12 for every trip you drive during the boosted hours! As long as you drive a weekly minimum of 10 trips during the boosted hours, your total fare for the listed hours will be averaged out to ensure that you get at least $12/trip! Example 1: Mr Tan drives a total of 25 trips during the boosted hours this week, and his total fares from these 25 trips is $250. However, because Grab promised him a guaranteed average fare of $12/trip, he should get $300 (25 x $12) in fares. As such, Grab will top up the difference of $50 ($300 – $250). After the 20% commission, Mr Tan will bring home $240. Example 2: Mr Ang drives 43 trips during the boosted hours this week, and his total fares from these 43 trips is $340. However, because Grab promised him a guaranteed average fare of $12/trip, he should get $516 (43 x $12) in fares. As such, Grab will top up the difference of $176 ($516 – $340). After the 20% commission, Mr Tan will bring home $412.80. There is a minimum trip requirement of 10 trips during boosted hours/week to receive Average Fares Guarantee. To be eligible for this scheme, you must maintain a 90% Acceptance Rate, 10% Cancellation Rate (CR) and 4.3 Driver Rating (DR) each week. You may opt out of your incentive before Wednesday of each week to receive your usual weekly incentive for the next week. How do I activate the incentive? Click on the “sign up” button before Wednesday, 11:59PM, each week. You will be given the new incentive on the next Sunday at 6.30pm. For example: Sign up before Wednesday ,11:59PM, 15 August to receive the programme for 20 – 26 August. Can I leave the new incentive if I don’t feel it suits me? Yes. You can opt out before Wednesday 11:59PM of each week and receive the regular trip based incentives instead. Do I need to sign up for the incentive every week? No. Upon signing up for your new incentive, you will continue to receive it until you decide to opt out. How long will the incentive programme run for? This incentive is ongoing, and you will automatically be included in it until you opt out, or the programme changes. What if I signed up multiple incentives at the same time? You only get 1 of the Own Time Own Target Incentives at any given time. You will be given the most recent incentive that you have signed up for. Will I receive other incentives if I opt out from the incentive? If you decide to opt out any of the incentives under Own Time Own Target, you will have the option to choose another of the 2 options or to receive your normal trip based incentive for the following week. Will I still receive my rental rebate if I signed up for this incentive? Yes, this takes the place of your usual weekly incentives instead, and as your rental rebate is not part of that, you will continue to receive it. Will the new incentive change every week? No, it’s a fixed incentive for the duration of the campaign. If I am contracted to a special incentive program (New Driver Incentives, PowerUp, SteadyOne, etc. ), am I eligible for these programs? No, you will not be eligible for the Own Time, Own Target Programme until your existing contract ends. Unless otherwise stated, only completed trips for GrabCar 4-Seater Economy, GrabCar 6-Seater Economy, GrabCar 4-Seater Premium, GrabCar 6-Seater Premium, GrabFamily 4-Seater, GrabFamily 6-Seater, GrabCar Plus, GrabAssist, GrabShare & JustGrab are eligible for incentives. As a reminder, drivers are expected to achieve minimum performance levels on Acceptance Rate, Cancellation Rate, and Driver Ratings in order to receive bookings on the GrabCar platform. Acceptance Rate cannot fall below 30%. Cancellation Rate cannot exceed 10%. Driver Ratings cannot fall below 4.3.